Objective: Oak Park, River Forest and Forest Park are eager to do business with the local businesses who support our community and help generate tax revenue. Our annual Procurement Expo is an opportunity to facilitate connections between the purchasing agents and representatives of local businesses. Businesses learn about the kinds of products and services needed and the process to become an approved vendor, how to learn about opportunities and who best to contact in the various organizations. Thanks to all who supported or attended our 2016 Procurement Expo on Sept. 29 at West Suburban Medical Center in Oak Park! 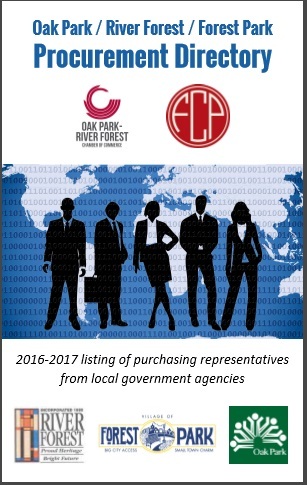 FREE copy of the printed 2016-2017 Procurement Resource Directory of all government procurement contacts!